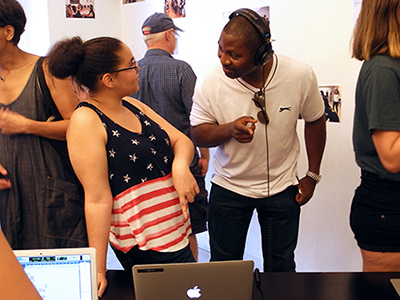 Now Accepting Applications for Sound Thinking NYC's 2019 Summer Intensive! Read about STNYC on Billboard.com! Join our STNYC email list! 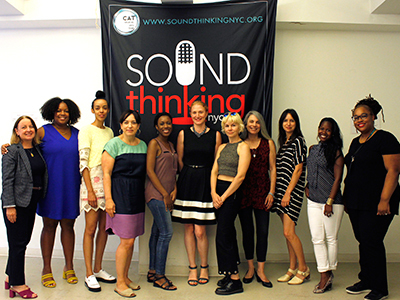 Sound Thinking NYC is a free program especially designed to open doors for young women to explore careers in the music industry. 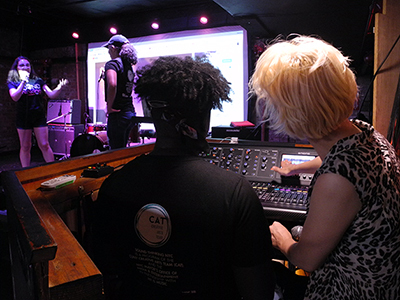 Sound Thinking NYC is a CUNY-CAT initiative with multiple levels of student engagement focused on increasing opportunities in the music industry for underrepresented groups, particularly women. All students who are interested in supporting gender equity in music are encouraged to apply. 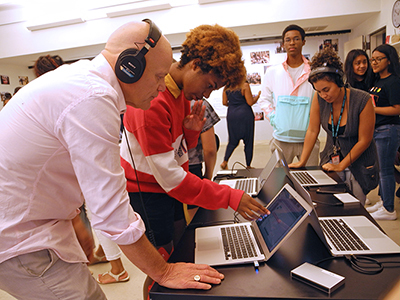 Summer Intensive graduates will be invited to Sound Thinking NYC 2018-19 school year events and will be offered opportunities for paid internships and credited College Now Courses in their 11th and 12th grade year. Sound Thinking NYC empowers young people as they explore how to turn their passion for music into a possible profession in New York City's thriving music industry. 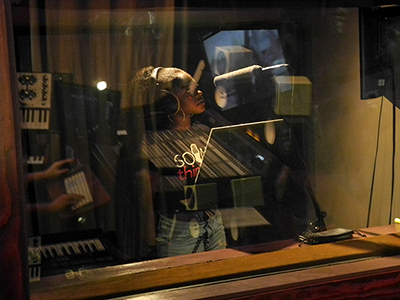 Addressing gender equity and building leadership skills in the music industry is a core part of this summer program that includes hands-on activities in music production and field trips to venues and sound production studios. Sound Thinking NYC is a free program offered by the CUNY Creative Arts Team (CAT) and the Mayor's Office for Media and Entertainment (MOME), in partnership with NY Is Music, a coalition of music industry leaders. 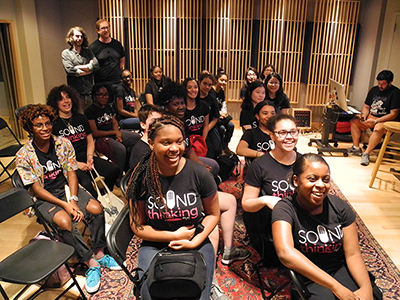 Sound Thinking NYC Summer Intensive is a free three-week long program that especially opens doors for young women in high school to explore careers in the music industry. 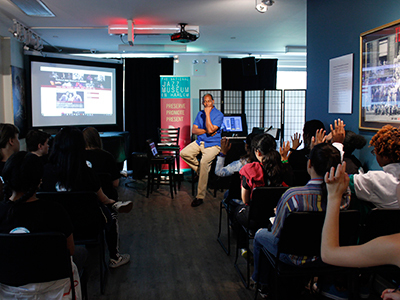 Adressing gender equity in the music industry is a core part of this summer program that includes hands-on activities in music production and workshops that develop leadership skills. All students who are interested in supporting gender equity in music are encouraged to apply. Summer Intensive graduates will be invited to Sound Thinking NYC school year events and will be offered opportunities for paid internships and credited College Now Courses in their 11th and 12th grade year. The Sound Thinking NYC Summer Intensive is for current 10th & 11th grade students in NYC who will be entering 11th or 12th grade in the fall. CAT's training and rehearsal spaces, at 101 W. 31st Street, 6th Floor, New York, NY 10001, will be the home base for this three-week, full-day (9am-3pm) summer program. build leadership skills and explore strategies for fulfilling goals in life, including career exploration and college readiness. Sound Thinking NYC leverages your passion for music as you explore how to turn that passion into a possible career. You'll be introduced to the varied opportunities and career paths available in NYC's thriving music industry - such as audio engineering, music production, sound design, and audio technology - directly from professionals in the business, all with a cohort of carefully selected, motivated fellow students. Metrocards for the three-week period and lunch will be provided. All Summer Intensive graduates will be invited to attend school year events and to apply for paid internships for summer 2020. Summer Intensive graduates attending DOE schools will have opportunities to enroll in free college courses, for college credit, during their junior and/or senior year of high school. Sign up here to receive updates about the program! 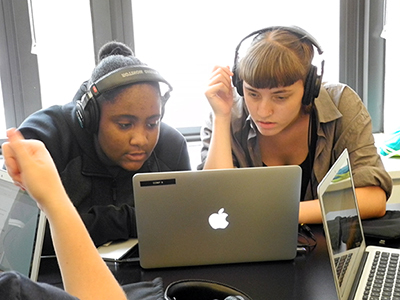 Sound Thinking NYC includes nine workshops and events across the school year, designed to support young people in exploring how a passion for music can lead to a profession in New York City's music industry. Five school-year workshops specifically designed for Summer Intensive graduates will support cohort building, mentoring and skill building related to exploring how a young person’s passion for music can lead to opportunities for careers in the music industry. Four school year events will be designed for families and any student interested in learning more about opportunities in the music industry. The Sound Thinking NYC School Year calendar of events will be listed in Fall 2019. Over the next four years, Sound Thinking NYC will deliver a multi-faceted program, providing opportunities for 250 students during their 11th and 12th grade years. A wider group of students and families will participant in Sound Thinking NYC programs designed for the public. 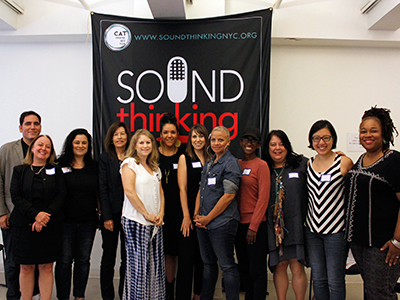 Established as part of a series of initiatives targeting the under-representation of women in entertainment, Sound Thinking NYC is a free program offered by the Creative Arts Team (CAT) at the City University of New York (CUNY) and the The Mayor's Office of Media and Entertainment (MOME), in partnership with NY Is Music, a coalition of music industry leaders. Sound Thinking NYC includes the Advisory Council listed below. If you or your organization is interested in becoming invloved by offering event sites, volunteer mentors, presenters, networking opportunties, internship placement, or other opportunties, please contact CAT Executive Director at jeannehouck@cuny.edu. The Mayor's Office of Media and Entertainment encompasses the key economic and creative sectors of film, TV, theater, music, advertising, publishing, digital content and real estate as it relates to these industries. In total, these sectors account for over 305,000 jobs, and an economic output of $104 billion. Under the leadership of Commissioner Julie Menin, MOME promotes New York City as a thriving center of creativity, issuing permits for productions filming on public property, and facilitating production throughout the five boroughs. It also oversees NYC Media, the largest municipal broadcasting entity in the country including five TV Stations and a radio station with a reach of 18 million households and a 50-mile radius. Co-founded in 2014 by Justin Kalifowitz, of Downtown Music Publishing, and musician William Harvey, NY Is Music is a coalition of more than 200 music industry stakeholders whose mission is to advance and promote awareness of the importance of music in economic development, culture, and education in New York. The Creative Arts Team (CAT) at the City University of New York (CUNY) provides drama-based workshops and programs in pre-K-12 schools, colleges and community centers in all five NYC boroughs. CAT has served more than a million youth, and thousands of educators and parents in NYC, throughout the US and around the world, since its founding in 1974. CAT is part of CUNY’s K-16 Initiative under the Office of Academic Affairs. Downtown Music Publishing is the leading music rights management company for the modern age. Based in New York City, with offices in the world’s major media centers, they own, manage, and develop extraordinary song copyrights. 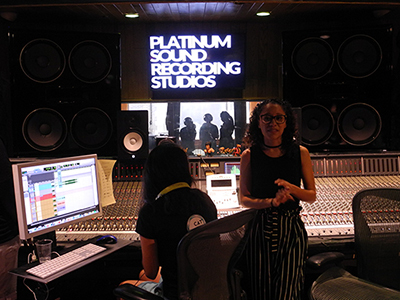 Platinum Sound Recording Studios was founded in 2000 by Wyclef Jean of The Fugees and Jerry ‘Wonda’ Duplessis, multi-platinum Grammy Award winning producer. The two came together with the goal of giving artists an unparalleled studio experience. By focusing on sound quality, productivity, and privacy, they have created a truly world-class space where artists instantly feel right at home, able to get into their creative flow and record the next big hit. Flavorlab is an award-winning audio production company that composes, records, mixes and masters music and sound for the biggest brands in the world, such as FOX, Polo Ralph Lauren, and HBO, utilizing the exclusive Producer’s Toolbox and licensing services for their show music. Flavorlab offers the ultimate mix of inspired creativity, technical know how, state-of-the-art infrastructure and customer service. MONOLisa Studios: Opened in January 2013 by recording engineer, Denise Barbarita, MONOLisa specializes in recording, mixing and producing music for bands and artists of all genres. The National Jazz Museum in Harlem, a Smithsonian Affiliate, is a thriving center for jazz that stimulates hearts and minds, and reaches out to diverse audiences to enjoy this quintessential American music. The Museum was founded in 1997 by Leonard Garment, Counsel to two U.S. Presidents, and an accomplished jazz saxophonist, Abraham D. Sofaer, a former U.S. District Judge who gave the initial gift in honor of his brother-in-law Richard J. Scheuer, Jr., and matching funds from the Upper Manhattan Empowerment Zone. BRIC Arts Media is the leading presenter of free cultural programming in Brooklyn, and one of the largest in New York City, presenting and incubating work by artists and media-makers who reflect the diversity that surrounds us. BRIC programs reach hundreds of thousands of people each year. In addition to making cultural programming genuinely accessible, BRIC is dedicated to providing substantial support to artists and media makers in their efforts to develop work and reach new audiences.